A rare 49 acre property in highly scenic Mulmur township is a naturalist’s oasis of forest, rolling hills, pond, river and cut walking trails to enjoy every inch of beauty it provides. Situated on a lightly travelled gravel road, with the driveway cutting through the trees, the house site is perched on a hill and not visible to other neighbours in any direction. A charming 1200 sq. ft. (plus more in the basement) bungalow built in 1960 with later addition has 3 small bedrooms, a large L-shaped living area with fireplace and a bright kitchen and dining room with 2 walls of windows looking out at the land. A 400 sq. ft. deck to the west is the favourite spot for dining and enjoying the outdoors with birdsong in the morning and the symphony of frogs at night. A remarkable ‘retreat’ for the weary urban dweller here is a place to plug into nature in a way that restores the health and well being of visitors and occupants. Located just one road west of Airport Road for easy access and one hour 15 minutes to the Airport. Alliston and Orangeville just 20 minutes away for major shopping/banking/restaurants/hospital. 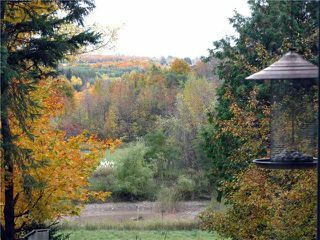 Just minutes to downhill skiing, cross country skiing, Bruce Trail, fishing, golfing and great country restaurants nearby.